SPECIAL: All books purchased via this website only are signed by the author, with a bookmark tucked inside and then tissue-wrapped with care before being mailed directly to you. Available wherever books are sold. If it’s not on the shelf, your favorite bookstore can order it via Lightning Source print on demand in the U.S., U.K. and Australia. Available via Barnes & Noble.com, Kobo, Amazon.com, and the iStore. 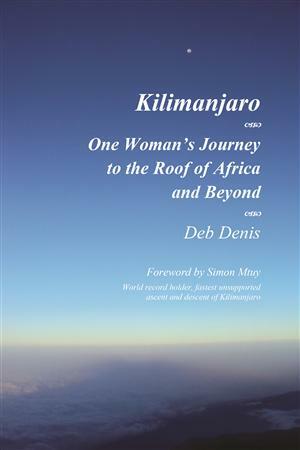 ~~~ When she was forty-five years old, non-athlete Deb Denis set a goal to climb Africa’s tallest peak before she turned fifty. She knew she could train up for the challenge—she had five years to get ready for it, after all. The opportunity to go to East Africa presented itself before she knew it, much sooner than she expected, and at a time when she and her family were in crisis. Hear the story of one brave woman’s journey—how she prepared to go it alone and the heart-wrenching life lessons she learned along the way, lessons that will have meaning for anyone who has experienced challenges and loss in their own life.